• For quantitative determination of sulfate ion and evaluation of drug effects on sulfate metabolism. 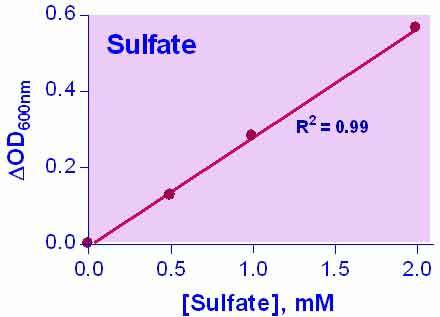 • INORGANIC SULFATE is one of the most abundant anions in mammalian plasma. Sulfate plays important physiological roles in activating and detoxifying xenobiotics, steroids, neurotransmitters, and bile acids. Sulfate is needed for the biosynthesis of glycosaminoglycans, cerebroside sulfate, and heparin sulfate. Undersulfation of cartilage proteoglycans has been associated with human inherited osteochon-drodysplasia disorders. In mammals, sulfate homeostasis is regulated by the kidney. The majority of filtered sulfate is absorbed in the proximal tubules, and only 5?20% of the filtered load is excreted into the urine. Simple, direct and automation-ready procedures for quantitative determination of inorganic sulfate find wide applications in research and drug discovery. BioAssay Systems sulfate assay kit is designed to measure sulfate concentration in biological fluids such as serum and urine. The improved method utilizes the quantitative formation of insoluble barium sulfate in polyethylene glycol. The turbidity measured between 540 and 610nm is proportional to sulfate level in the sample. 1. Why is a small amount of the standard added to the working reagent A. This assay is based on the precipitation of insoluble barium sulfate which is measured turbidimetrically. Barium sulfate is minimally soluble, though, and to saturate the working reagent with soluble barium sulfate, you have to add a little of the sulfate standard to reagent A (which only contains barium). After that preparation step, all additional sulfate from your sample will precipitate when the working reagent is added allowing you to measure it.